Winter here in Arizona is just NOT the same as Utah. Since we have moved, we have really loved the warm weather, but sometimes we get a little ache for the familiar seasons. Well, with the winter months in full swing, I thought it would be fun to bring a little snow to our Arizona winter – without the cold! 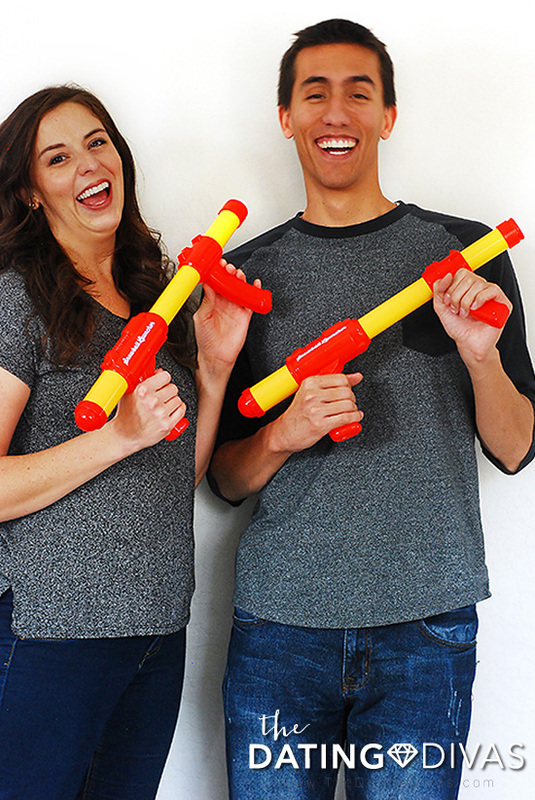 I found some amazing snowball launchers on Amazon (see the link below) and worked with our designer to create an epic indoor snowball fight that might just be our favorite at-home date that we have done so far. 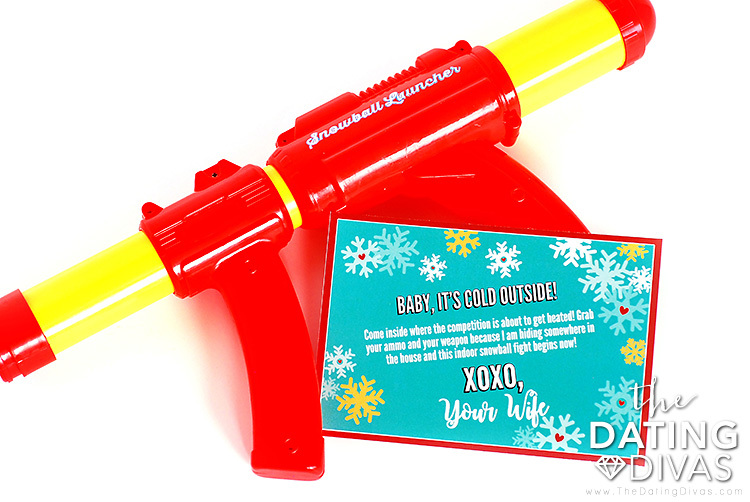 Laid out where your spouse can see as soon as they walk in the door – they find this note challenging them to an indoor snowball fight, their very own snowball launcher and some ammo (aka fake snowballs!). And the epic indoor snowball fight battle begins! 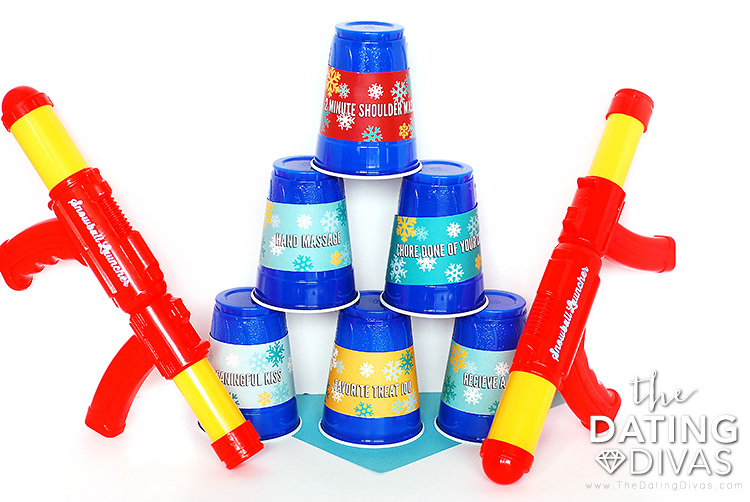 First, you will want to get your hands on these amazing snowball launchers. We found ours for cheap at Home Goods, but buying them from Amazon is so convenient! These launchers come with eight snowballs each and worked really well! Now, any normal snowball fight could be over within a few minutes, but we have everything you need to make the experience even better! 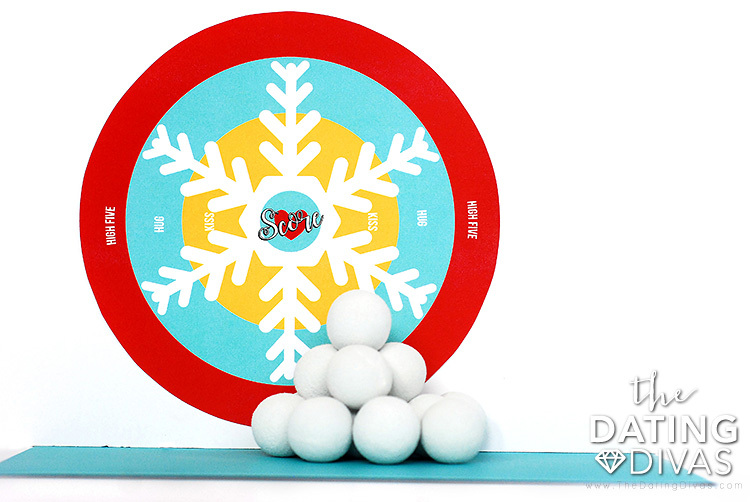 We have three totally fun and challenging games for your indoor snowball fight. 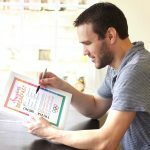 All three games come with free printable downloads created by our talented designer Carisa from the site Messes to Memories. 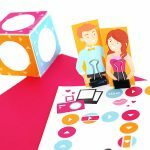 She put together the perfect set for a fun date activities to make your indoor snowball fight one of your favorite date night activities EVER! This first game’s goal is to not get hit by the snowball. Pretty basic, right? 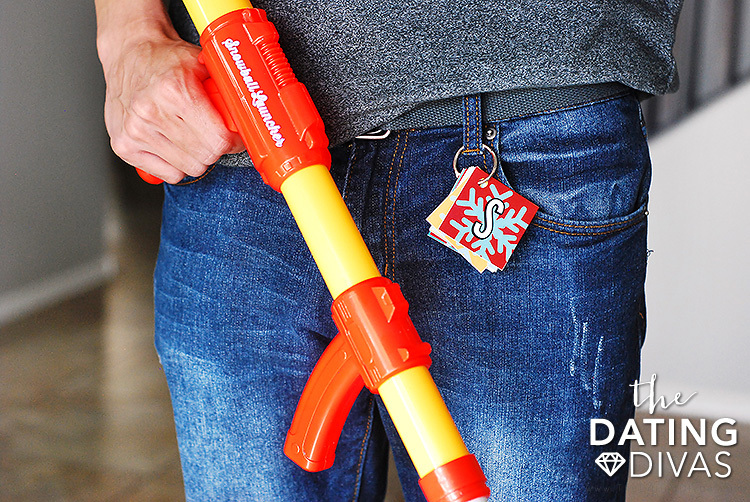 To keep track of how many times you have been hit and to give glory to the ultimate winner, we have tags that spell out S-N-O-W-B-A-L-L that you can attach to a key ring. Each time you have been hit, you flip a letter. Once you have gone through all the letters – you are out of the game. For this game, you get to take turns hitting a central target – with added benefits! Set the target up and determine your starting point. Our printable bullseye includes extra motivation for getting closest to your goal. Hit the outside of the target and you get a high five. Get a little closer and you get a hug or a kiss. Hit the bullseye and well, you score (I will leave that to your own interpretation – wink!). We were surprised at how challenging this actually was. I really struggled to even hit the target! This was my favorite part of the date. For this challenge, I wrapped printables with written rewards around a large Solo brand cup (but almost any plastic cup would work). We set them up on the counter and tried to knock them down with the snowballs from our snowball launchers. We both aimed first for the backrub and I am happy to gloat that I got it first! The competition was fierce for this one! Unfortunately, I never did knock down the one to earn a chore done. I had great ideas in mind for that one! This date was seriously so much fun! It was challenging, it was silly, it was a little competitive, and gave ample opportunities to flirt – ha! 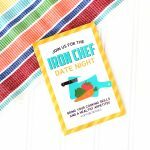 We love that we’ll be able to do it over and over again so if you think you want to try it’s probably a good idea to pin this idea so you’ve got it in a handy place each time you need a winter date night. We even decided that next time we have a disagreement on a decision, we might use the cups to determine who wins! I also think that this might be a winter tradition for us – this was definitely a date that we would do again. Need more target practice? 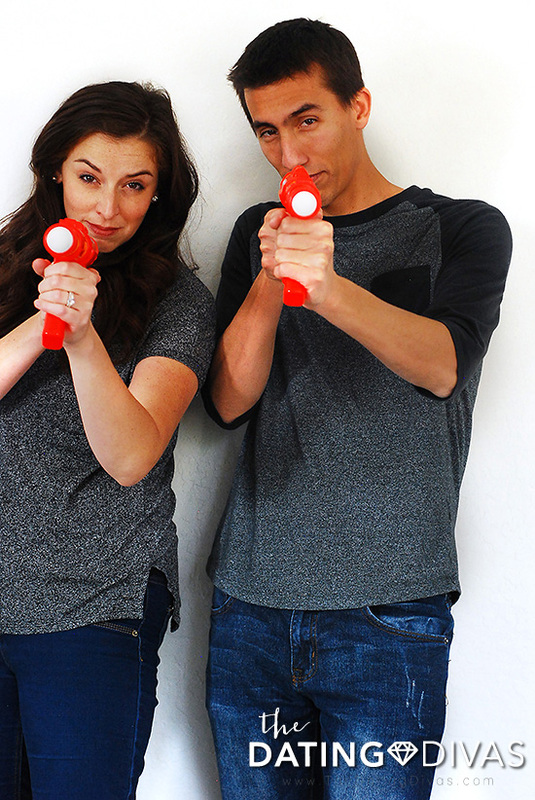 Check out our Nerf Wars Date or head out for something more official with our Shooting Range Date! This looks SO fun! We totally are gonna try this. This is the closest thing we’ll get to snow down here in Texas… such a fun idea! LOVE THIS!! Utah winter has been SO warm this year, my MT heart is missing snow angels, snowmen and snowball fights! 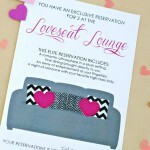 Can’t wait for this date night! You guys totally have matching shirts! This looks like a blast! This looks so fun! I have snow all around me outside, but this is more up my alley. This is right up my alley! We LOVE having nerf fights in this house so a snowball fight would kick it up a natch! Thanks for the amazing idea Sarina! Lov it! Oh GOSH, Sarina! This is darling! 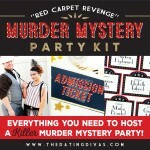 I totally want to do this date!!! !